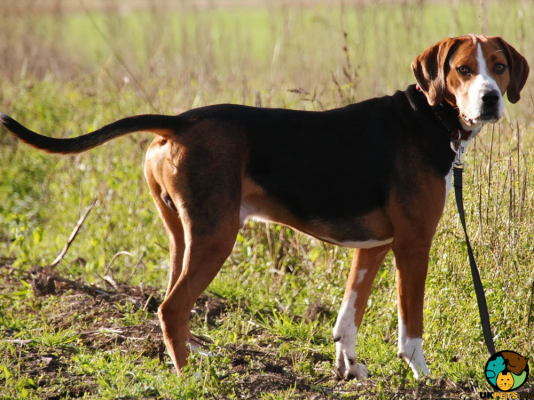 The Hamiltonstovare is a hunting hound dog bred and developed in Sweden in the 19th century by its namesake Count Adolf Hamilton. It is believed to be descended from the English Foxhounds and Harriers, among others. With gentle and even-tempered disposition, the Hamiltonstovare is an excellent family companion. Weighing 50 to 60 pounds and with an average height of 46 to 60 centimetres, this dog is a large breed with a tremendous presence that adds to its appeal. It is also an outdoor-loving dog, which means it is not fit for families with a sedentary lifestyle. Do you think you have the patience and the energy to keep up with a Hamiltonstovare? Find out more about its characteristics below. The origin of the Hamiltonstovare can be traced back to the 19th century Sweden. This dog breed was developed by Count Adolf Patrick Hamilton, founder of the Swedish Kennel Club. 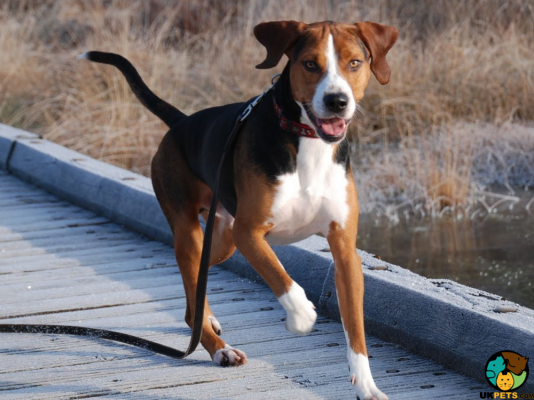 This hound dog was originally called "Swedish Hound" until it was renamed in 1921 to honour Hamilton as its foremost breed advocate and breeder. 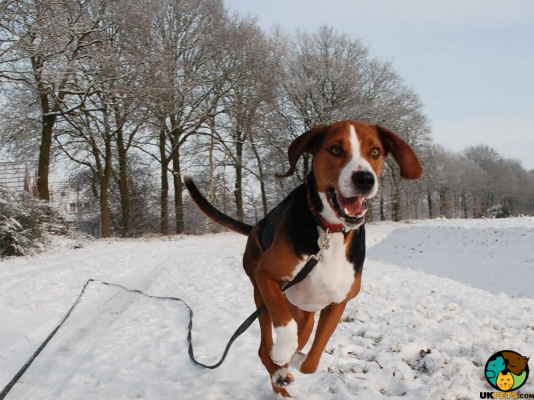 Its ancestry is believed to include the English Foxhound, Harrier, Holsteiner Hound, Curland Hound and the Heiderbracke. The Hamiltonstovare was bred to hunt fox and hare on difficult terrain and in harsh weather and as such excels in flushing and tracking live game. In 1886, the Hamiltonstovare became the most popular hound in the country. Today, this dog breed is still not as popular outside of Sweden and so is considered a rare breed, although it is slowly making a name for itself in the UK as both a companion and a show dog. Weighing 50 to 60 pounds and standing 40 to 60 centimetres at the withers, the Hamiltonstovare is a large and sturdy dog breed. It has a slightly longish, rectangular head, broad skull and well-defined but not overly emphasised stop and relatively long and rectangular muzzles. It has clear and dark coloured eyes with a calm and intelligent expression. It has ears that are drop down and set quite high, slightly above its eyes. Its nose is black, well-developed, and almost parallel to the line of the skull. It has full lips and wide nostrils. This Hamiltonstovare boasts of a beautiful two-layer glossy short coat comprised of a short and soft undercoat that is especially thick during winter, and a weather-resistant topcoat that lies close to its body. The dog breed comes in colours of black mantle, rich gold, and rusty red tan, that come with symmetrical white markings. In order to keep its coat in top shape, weekly brushing is required. It is low maintenance because it does not shed much. Other than coat care, don't forget other grooming aspects of your Hamiltonstovare. Check its ears for any signs of infection such as redness, pain and bad odour. Dental health is equally important as dogs also often suffer from gum diseases and bad breath. Brush its teeth at least twice a week, or daily if you can. Dog nails also grow long like humans and so must be trimmed regularly especially if you start hearing clicking sounds on the floorboards. Long nails can also cause discomfort as they often get caught in things such as your carpet, beddings and upholstery. The Hamiltonstovare is both an excellent hunting dog and family pet. Its sweet disposition and affectionate nature, despite its large size, make it a favourite companion. It is extremely attached to its owners and so it is not happy when left alone for long periods of time. This dog breed is, as it goes, among the best choice for families where at least one person stays at home to keep it company. Hamiltonstovare is aloof and wary of strangers and will take some encouragement to warm up to other people outside its family. It has a tendency to bark to alert, which makes it a superb watchdog. Although, it should never be aggressive unless its owners are in danger. It is also important to provide this dog mentally and physically stimulating activities since it can pick up bad habits out of boredom such as digging and chewing. Since it is bred to follow directions as a hunting companion, the Hamiltonstovare is not a hard breed to train. The key to its successful training is positive reinforcement in the form of treats and praises. Early socialisation also plays a big part in making sure it grows up to be a well-adjusted, calm and confident dog. The Hamiltonstovare is patient and gentle with children. However, it can also be slightly boisterous and as such should not be left unattended with toddlers as its size can easily topple over small kids. Other dogs are not an issue with the Hamiltonstovare since it can get on well with them, but smaller animals such as cats and rabbits will appear as prey to this dog, especially if it has not been socialised or they were not raised together. A typical serving for an adult Hamiltonstovare is 2.5 to 3 cups of premium dog food per day, equally split into two meals. Dogs, much like humans, have unique dietary needs which may be affected by factors such as age, gender, size, build, health, metabolism, and activity level. Make sure you're making the right choice for your dog's nutrition. Feel free to consult a veterinarian or a canine nutritionist for dietary recommendations. Make sure to feed this large dog with top-quality dog food formulated for its size since it has different nutrient needs than small and medium breeds. Dry kibbles or homemade dog food with high animal protein (beef, lamb, chicken, and turkey) is recommended. The Hamiltonstovare can live from 10 to 13 years when they are cared for properly and given enough love and attention. Although it doesn’t necessarily suffer from hereditary diseases, there are health problems known to affect this large breed such as Hip Dysplasia, Epilepsy, Cancer, and Bloat or Gastric Torsion. Like any breed, the Hamiltonstovare requires considerable amount of exercise to be happy and healthy. 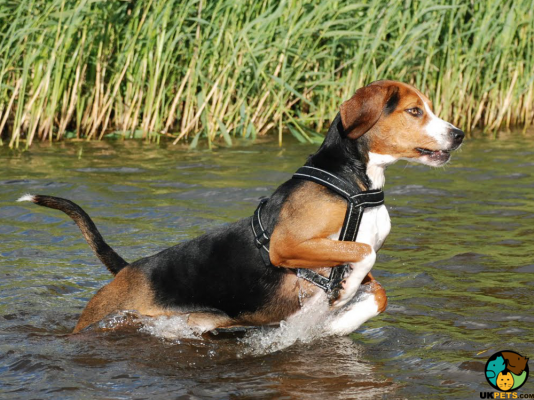 For this active hound, at least two hours of physical and mental stimulation, making it an ideal breed for people with an active and outdoor lifestyle. Since Hamiltonstovares are scent hounds, they will follow any scent their nose captures so make sure they are within a securely fenced area such as the back garden or yard. When raising a dog much too often, people do not understand the huge responsibility in the financial aspect. Buying a dog like a Hamiltonstovare and feeding it twice a day will not equate to responsible dog ownership, as it entails more money-wise. For instance, you may be able to buy a Hamiltonstovare puppy for over £500, but you must also consider getting a pet insurance so you have a safety net in the event it gets suddenly sick or gets into an accident. Pet insurance for that matter will cost around £60 to £100 a month. Let us say you have already prepared to spend £40 to £50 a month to buy quality dog food formulated for large breeds such as the Hamiltonstovare, but are you financially ready to make sure it is healthy and not suffering from any health problems? Veterinary costs for this breed will set you back at least £1,200 a year. This will include regular veterinary check-up and procedures such as vaccination and boosters. On average, a Hamiltonstovare will cost you £100 to £170 month on month. It is also worth repeating that the Hamiltonstovare is a rare breed and as such only a few puppies are bred and registered yearly, which means you have to be patient to get one as you will be put on a waitlist. Is a Hamiltonstovare Right for You? The Hamiltonstovare is both an excellent hunting dog and family companion. This breed is affectionate and forms strong bonds with its family. It is protective and will bark to alert, which makes it a great watchdog. If left to its own devices, they can be destructive. It only requires at least two hours of daily exercise. It has low grooming needs as it has a short coat that sheds minimally.